SQL Server 2017 is now available within Azure – ready and prepared on both Linux and Windows virtual machines. Deploying SQL Server within Azure VMs combines the industry-leading performance and security, built-in artificial intelligence, and business intelligence of SQL Server, now available on both Linux and Windows, with the flexibility, security, and hybrid connectivity of Azure. 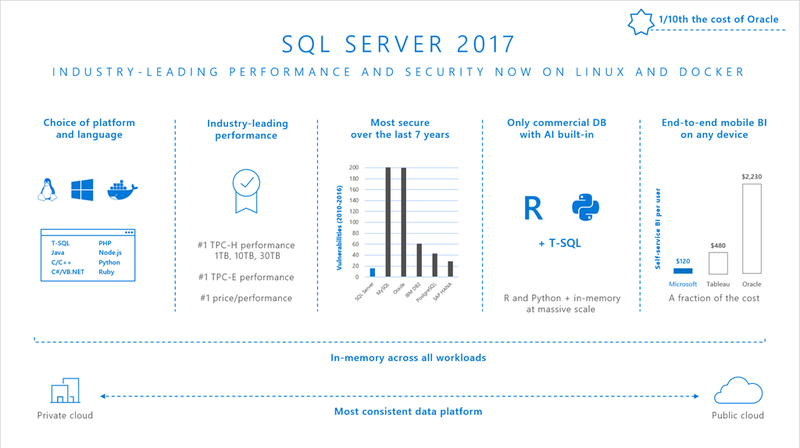 SQL Server 2017 is the first SQL Server release available on Linux, in addition to Windows, meaning that you have the choice of running SQL Server on virtual machines based on Windows, Red Hat Enterprise Linux, SUSE Enterprise Linux Server, or Ubuntu. SQL Server 2017 also provides new capabilities, including graph data management and analysis, Adaptive Query Processing, and advanced intelligence built-in with Python and R analytics plus native scoring in t-SQL. New images published today are for standalone SQL Server 2017 instances. Images are available for all editions of Windows Server 2016 as well as on all the Linux distributions supported by SQL Server 2017: Red Hat Enterprise Linux 7.4, SUSE Enterprise Linux 12 SP3, Ubuntu 16.04 LTS. Latest versions of the most popular VM sizes (DS, ES, GS, and MS) include options which constrain the vCPU count to one-half or one-quarter of the original VM size, while maintaining the same memory, storage, and I/O bandwidth. The licensing charged for SQL Server will be constrained to the new vCPU count, resulting in a 50% to 75% increase in the ratio of the VM specs to active (billable) vCPUs while allowing workloads to maximize usage of available vCPU. Contact Transparity to learn more. Also, environments within Azure can now build increased resiliency by using availability zones. Availability zones are a step forward in providing solutions to support the most demanding, mission-critical workloads. A client running SQL Server 2017 in production on Azure Virtual Machines where their SQL Server database is located on a Linux-based VM’s have seen huge performance enhancements in their financial reporting and analytics platform (previously ran open source software on competitor cloud). They were seeing the software performance slow down as the company grew and complexity increased. By moving to SQL Server running on Azure virtual machines, they were able to reduce query response time from 30 seconds to 1-2 seconds and cut management time by 90 percent.